Sometimes I catch site of myself in the mirror before we head out the door and it's really not all that impressive. Jeans and a t-shirt again? Or is it a tank top and yoga pants today? Then I sigh and think that at least my kids usually look presentable. For me to wear anything other than my standard mom uniform, however, I have high standards as to what that clothing looks and feels like. I want high fashion, classic styling and extreme comfort at an affordable price. I want to still look like me... just better. To find that all in one place, now I know that I don't have to look any further than the gorgeous designs of William Riera USA. Sketching clothing since the age of 12, William Riera knows fashion. After his many years of experience, his time at fashion school and having worked with clients from all over the world, one visit to his website and his attention to detail and dedication to high quality are immediately evident. And then the Chloe dress arrived and I was able to see that William Riera USA really is a step above the rest. 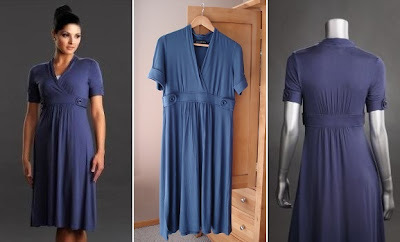 The description of the Chloe reads as "Blue jersey empire waist dress with gathered faux wrap neckline. Button details on waist band and sleeves. Short sleeve," but that doesn't even begin to explain how great this dress is. The fabric (washable!) is soft and flowing and feels silky smooth on my skin and even though I have worn an empire waist dress before, this one just seems to understand exactly where to cling and where not to in order to flatter a woman's figure. I love the addition of the buttons, as they somehow add just the right touch to the already-cute sleeves and the well-placed waistband. Needless to say, this dress fits extremely comfortably and by adding a camisole underneath, I felt perfectly covered with just a hint of sexiness from the faux wrap. Add some diamonds or pearls and a pair of heels and the Chloe is plenty sophisticated enough for a special occasion, but slip on a pair of flats with a ponytail and I'm ready to bring my daughters to the library with no problem. Combine the versatility, fit, style and quality of this dress and it's no wonder that William Riera has fans far and wide. If gorgeous dresses weren't enough, there is also a line of William Riera USA necklaces that are just as stunning. 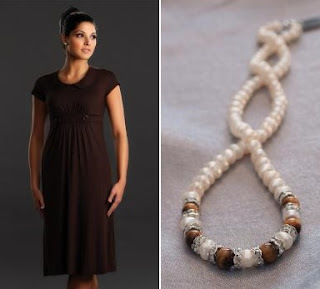 From large and chunky pieces that really make a statement to elegant pearl and stone combinations that are timeless, any item from the jewelry collection would perfectly complement the beauty of a William Riera USA dress. With a commitment to high quality, high fashion and flawless tailoring, William Riera dresses and accessories are stylishly attractive while still affordable enough to not break the bank. Right now his line of great dresses that are regularly $53 - $57 are on sale for $45 - $48 and almost all of the necklaces are discounted to $18 - $30. Looking chic while saving money? I couldn't ask for a better reason to leave my jeans at home and head out looking good and feeling confident. To enter to win: Visit William Riera USA and tell which of their gorgeous dresses is your favorite. 2 Extra Entries if you Like William Riera USA on Facebook. 3 Extra Entries if you blog about this giveaway linking back to Thanks, Mail Carrier and William Riera USA. Please leave an address where it can be found. A big thank you to William Riera USA for providing a Chloe dress for me to review as well as an item of choice for one lucky giveaway winner. The opinions shared are my own and honest and if you really need to see more, click here to see how I roll. My favorite dress is the "Vera." I entered the juliethefish designs giveaway. I love the "HEIDI". How cute is that!!!! I like the Heidi dress. I love the choloe dress the best! 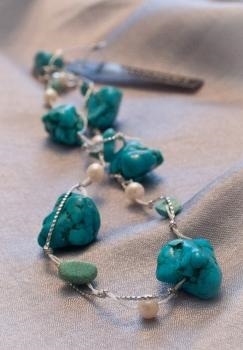 I also love the braided turquoise necklace! I entered the juliethefish jewelry giveaway! I entered the growing trees giveaway! I love the Chloe dress! I am following the William Riera blog! I LOVE!!! the "Renee", everything about it is LOVELY!!! the empire waist and the half selves are my FAVORITE!!! I wrote on the wall @ William Riera USA. I follow williamrierausa on twitter. I follow William Riera via GFC. I signed up for William Riera USA newsletter. I entered the Power Home & Office Mat Wireless charger. I entered the 1-800-Flowers.com $50 gift card giveaway. I love the "Athena" dress! I entered the Growing Tree Toy $25 gift certificate giveaway. 1 Like William Riera USA on Facebook. 2 Like William Riera USA on Facebook. I follow William Riera USA on Twitter. I entered your 1-800-FLOWERS.COM giveaway. The Heidi dress is my favorite!! I love the Renee dress and the Pearl & Blue Coral Necklace. All the dress are so beautiful. Following your blog via Google Friends Connect. left message on William Riera's facebook wall. I like the "Athena" dress! Follow William Riera USA via Twitter. Follow William Riera blog via GFC. Signed up for William Riera USA Newsletter. Entered My Pillow Pets giveaway. Entered My Baby Clothes Boutique giveaway. Entered Time Out To Rock- Not-Its! Giveaway. I love the pearl necklace with blue stones.